I really could have gone one of these Goji Berry Granola Bars last Sunday. Disneyboi and I both ran 6miles (10K) in aid of Sport Relief and the bars would have provided us with plenty of needed energy! nu3 a company which sells nutrients and supplements across Europe asked if I would like to try out their Goji berries. As you may know goji berries are powerful wee things – packed full of protein, vitamin C, carotenoids, B vitamins and iron. And that’s only half of it. Plus they taste lightly fruit and almost a bit like tea. So I wanted to incorporate these dried superfruit berries into something slightly on the healthier side – granola bars. They are made with toasted oats, chopped hazelnuts and other delicious healthier ingredients. They are bound together by a bit of butter and sugar, but that makes them perfect energy bars. Line an 8”x8” square baking pan with greaseproof paper and set aside. Preheat the oven to 180C and place the oats on a large baking sheet (if the hazelnuts aren’t pre-roasted, add them to the baking sheet also). Pop into the oven when it gets to temperature and bake for 5 minutes, remove and stir about and return to the oven for another 3 minutes. Transfer these to a large bowl with the coconut. In a saucepan, melt the butter, agave nectar (or honey), sugar, vanilla and salt and then add to the mix of nuts and oats. Stir thoroughly to combine. Add the goji berries and mix in thoroughly. Lastly add the chocolate chips, after leaving the mix to cool a little. They will still melt slightly, so don’t worry. Transfer the mix to the prepared pan and press down firmly with an off-set spatula or similar. Press down as hard as you can to ensure the bars stay together and don’t crumble away. Pop into the fridge for two hours to cool. Once set, remove from the pan and peel away the greaseproof paper and with a sharp knife cut into bars. I got 18 from my batch. 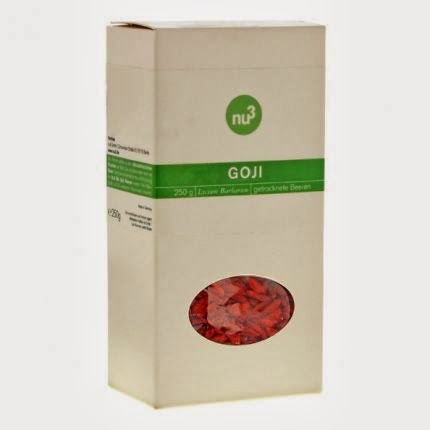 Check out nu3 for the goji berries and their other items. And lastly a big thank you to everyone who sponsored Disneyboi and I for our run. Between us we raised over £450 in aid of Sport Relief. Disclosure Statement: I received the goji berries free to review. I was not asked to write a positive review and any opinions expressed are my own. These aren't baked Fan, just the oats are toasted beforehand - the colour really comes out though when mixed with the other ingredients. These look yummy! Huge congrats on the run and money raised - what an amazing effort! Thank you Kat. Now I want to run a half marathon - eek!! The only defences we have had so far against necrosis are the antioxidants that appear in nature.